I was a bit late in dropping my daughter off for school, so I wasn’t able to escape without being caught in the hallways, listening to the national anthem, and then the grade six students reading the morning announcements. As I was making my way out the front door, I heard the school’s quote of the day and it stopped me in my tracks. “An eye for an eye only ends up making the whole world blind,” read the eager twelve year old over the PA system. It was her next sentence that stopped me in my tracks. I pulled out my iPhone to consult Google in hopes of proving my point. I had every intention of walking into the office as the latest in a long line of self-righteous North Toronto parents, determined to set the record straight. …an important biographer of Gandhi, Louis Fischer, used a version of the expression when he wrote about Gandi’s approach to conflict. 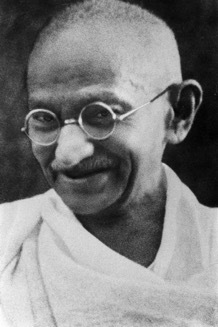 However, Fischer did not attribute the saying to Gandhi in his description of the leader’s life. Instead, Fisher used the expression himself as part of his explanation of Gandhi’s philosophy.